Happy Sunday! This morning I found myself with a big box of organic potatoes sitting on my counter leftover from a event this week. 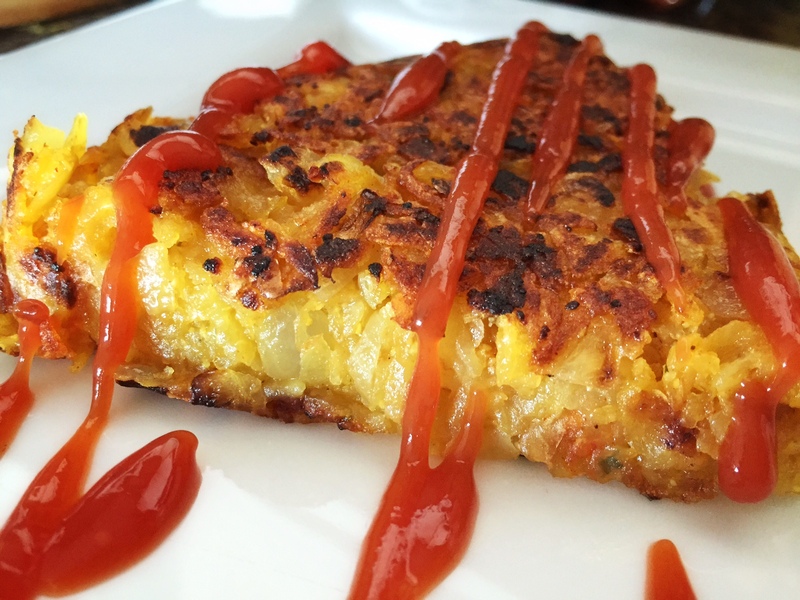 I thought, perfect, I will make a Hashbrown Cake! This recipe is super easy and great served on it’s own or with roasted veggies on top or next to a tofu scramble. I hope you enjoy! Grate the potatoes (skin and all) and place in a strainer. Push down with your hands and try to press as much water out as you can. Put in a bowl and add the onions and all the seasonings. Mix well. In a 8″ skillet heat up 2-3 tbsp. of olive oil on medium-high heat. Press the potatoes smooth into the pan. Place a lid on the pan and cook for 7-10 minutes, shaking the pan occasionally to make sure it’s not sticking to the bottom. With a spatula, carefully lift and edge to check the color on the bottom. If it is golden brown, give it a flip. If it is not, let it cook another few minutes. Once it is flipped, let cook another 5-8 minutes or until that side is golden as well. Serve immediately with homemade ketchup or Follow Your Heart Vegan Ranch.